First, allow yourself time to worry. Trying to force yourself not to worry about things is a sure recipe for making yourself worry more. Set an egg timer for five minutes. When the egg timer goes off, your period for worrying is done. This allows you to “get it out” while also putting it behind you. Progressive relaxation is a great way to rid your body of stress. The body and mind are not as separate as many people think. Stress in your body manifests as stress in the mind and vice versa. Progressive relaxation is a way to address this. Tense the feet for 10 seconds, release the tension for 10 deep breaths, then tense the feet again. Repeat step two up your body doing calves, thighs, pelvic area, abdomen, chest, arms, hands, neck, and face. Lay on your back for five minutes taking deep breaths. Progressive relaxation is one of those things that sounds like it won’t work, but works very well. Try it out and see if it doesn’t help clear your head of worrying. Some problems cannot be dealt with. Others have solutions or ways to mitigate damages. Begin planning how you are going to tackle the problem. Don’t stress over whether or not you will succeed. Rather, think clearly and carefully about what you can do to address the problem at hand. If you find that you can’t come up with any solutions at the time, go do something to take your mind off the problem, then come back to it. If you find that you are too worried to think about the problem, try more progressive relaxation, then get back to the problem. Build up a savings reserve. This will give you money for a rainy day. Start paying off debt. Making significant inroads on debt always feels good. Consolidate bills wherever possible. Student loans are a commonly consolidated form of debt. Quit looking at your 401(k) constantly. Your repeated views do nothing but stress you out. Get ahead on your bills. Being one month in advance on your bills is a far better feeling than being one month behind. Not all of these may be feasible with your financial situation. However, you should implement the ones that are. Not only does it make good financial sense, it also gives you less reason to stress over money. Worry and stress are not the same thing. While stress can be a useful goad toward action, worry is little more than a spiral of inaction. Ridding your brain of worry will free up your mind to proactively tackle problems. This, in turn, will give you less to worry about. Attacking worry has a cyclical effect in this manner. While it might take some time to see results, strategically dealing with your worry will pay dividends over the long term. Wow! This is exactly what I needed to read. I can use all the reminders I can get about how important it is to take one day at a time-------and not try to live distracted by what "might' happen in the future. 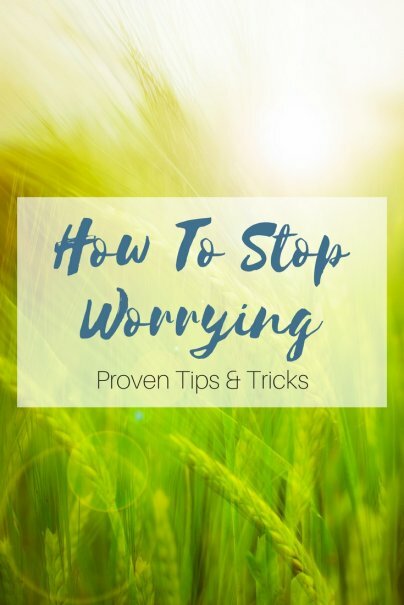 This one gives 4 more strategies to use to overcome worry. I've used some of them to stop anxiety from taking hold and becoming a vicious cycle of worry. Good, practical advice given there too.